Maxi exudes an indefinable nonchalance, inadvertently commanding the studio he confidently inhabits. His heroic and willful stubbornness has been tempered with a gentle and playful nature that has earned him the respect and admiration of all his colleagues. At 15 years of age, Maxi is no stranger to extended naps, enlivened with ‘melodic’ snores and post noon flatulence. Mieko is gentle and patient. She is particularly amazing around little children and will calmly stand there while they pull her tail or yank her fur. She is also very affectionate and likes maximum contact so she often sits on people’s feet or tucks her head under their arm if she wants to be patted. Mieko can be very stubborn and if she decides that, for example, she has walked far enough, nothing can make her walk any further. Even though she is nearly 12 years old Mieko still has a luscious coat, clear eyes and a youthful attitude. She is a truly beautiful dog inside and out. Mosh House was built in 1903 with the modern extension created by Foomann Architects in 2011. The brief was to instil the fun and glamour of the Case Study Houses into our home and we think they succeeded. When we open the sliding doors – which we do often – the family room becomes a pavilion that embraces the outdoors. What sort of vibe does your dog bring to your home? Mieko exudes a calming sense of zen into our home and generates love in the hearts of everyone who lives here with her. Was your dog considered in any of the design, layout, or choice of finishes for your home? 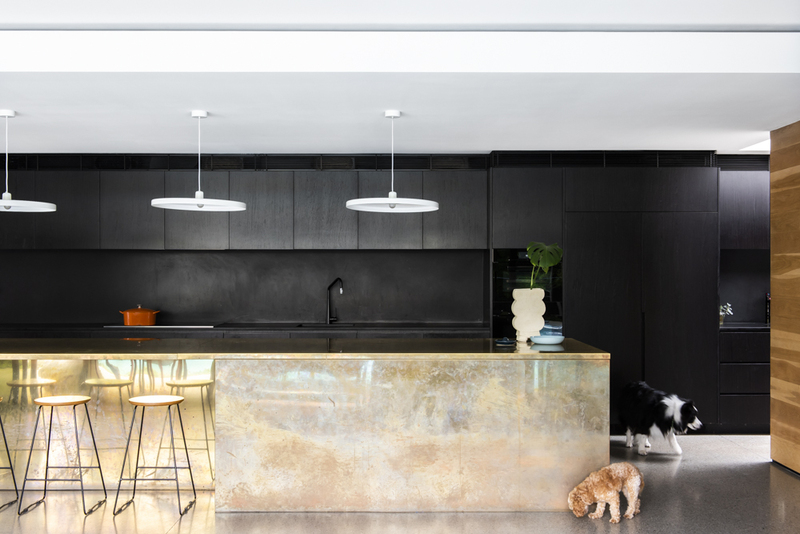 On a subconscious level, Mieko’s magnificent tricolour coat has influenced the colour scheme in our home – from the black kitchen, to the pale floors and the tan ‘Frog’ armchairs. Whats your dogs favourite hanging out spot? Mieko likes to lie on the over-dyed vintage black and white rug where she is virtually camouflaged. She can also be found on the deck under the grapevine or in the master bedroom blocking the wardrobe. In the height of summer she is usually splayed on the tiled bathroom floor next to the air conditioning vent. If dogs and their owners are supposed to look the same, does this reflect in the design of your home as well? Like Mieko, our home is big, welcoming, glamorous and playful. What makes your dog unique? Mieko is almost 12 years old, which is very old for a Berner. We like to think her longevity is a result of morning swims in the bay (the beach is at the end of our street), regular acupuncture and daily doses of confidence-building compliments (it’s impossible to take her for a walk without people admiring her beauty). The fact that she has so many favoured sleeping spots means she also gets a lot of incidental exercise between naps. How did you choose your dogs name? My daughter made up her name. We like to think it sounds part Japanese and/or part Danish and therefore edgy and sophisticated. If your dog said something about the house, what would it be? The wooden floorboards are too slippery! Any other stories to share? The Indian Minah birds nesting in our front garden like to terrorise Mieko by swooping on her head. They are so mean to her and not at all afraid of her loud bark. She’s a loving, social dog but when there are too many visitors, she likes to escape upstairs to the quietest corner of the house, making a brief appearance only when the food is served. On a warm summer’s day we open up all the sliding doors so it’s hard to keep her outside when she’s wet. She often sneaks in to our bedroom when drenched after her morning swim. Bones is my companion. A dead-set legend. I have total trust in Bones. I’d have him do my tax and teeth with confidence that he’d do a fine job. He is uniquely free of neurosis; other than a white-hot fear of highfives and balloons. Bones is very good at sport. Our home’s 80m2 is split over four half levels. We retained the shell - a 1970s, modernist, concrete block number designed by Mike Morris, who I worked for as a student. The additions are intended to be as unfussy and enduring as the original. It’s super efficient with the height and small footprint providing excellent access to light and air. Being my own home; there are lots of reclaimed materials and little experimental details. It’s lovely to live in. Bones is low key with few needs but when I’m home without him; the house feels alien. He’s sensitive and tends to reflect and amplify the mood. When our preschooler loses his mind; Bones will ratchet the tension through barking. Finishes are textural and tough. Bones sheds; so his fur works with everything. We also installed a doggy door that he doesn’t use and we prefer not to talk about it. Whats your dogs favourite hanging out spot/furniture/room etc? When someone’s home he loves the floor by the entry, which is warmed by the winter sun and our bedroom where he can watch the street. Being smart, he heads straight to the couch whenever he has the house to himself. One time I caught him standing on the coffee table. I guess he wanted to partake in the forbidden. I think Bones and I look alike; but the home and Bones share a bit in common too. The original was built in 1970 and Bones’s hair and beard are in a style that was very popular in that era. At times he resembles 1970s Kenny Rogers but I’ve looked up his house and it isn’t like ours; it’s much larger with colonnades, etc. A dog is far more than the product of their breed but from this perspective, as far as we know - he’s it. There were two other pups in his litter that looked completely distinct. Apparently a case of superfecundation (look it up) which is common with dogs (it was news to me). Having said that – we live near the North Melbourne’s Lost Dogs Home and Lort Smith and we’ve witnessed that when you keep mixing breeds they often end up with a few Bones qualities. Honestly I named Bones years before adopting him. It was a safe bet that any dog would like bones and it’s easy to buy for a one named Bones given how popular it is as a motif in pet stores. I like to think that he’d be complimentary. He might express gratitude for the many steps and levels which allow him to gain higher ground (he’s not very tall). Any other fun stories to share? Holidays are an eventful time for Bones. There was the event with the seal and the event with the puffer fish. One that stands out is when we were at a friend’s place in Barwon Downs. Bones was agitated and wouldn’t let me sleep. I couldn’t work out why, as there didn’t appear to be anything wrong. I trust Bones and for good reason; he has never let me down. So at 1am, I woke my friends, borrowed their car and drove 2.5hrs home to be near the vet. He was completely fine and happy to be back. I’ll never know why he made us abandon my partner and newborn on that holiday. Poncho is a 2 year old chocolate Labrador who loves nothing more than food and chasing his frisbee at the beach. He is the most cuddly and intuitive dog we have ever had. He has an on/off switch where he can lay around all day snoring like a little piglet, but once you give him the play signal he comes to life in an instant. 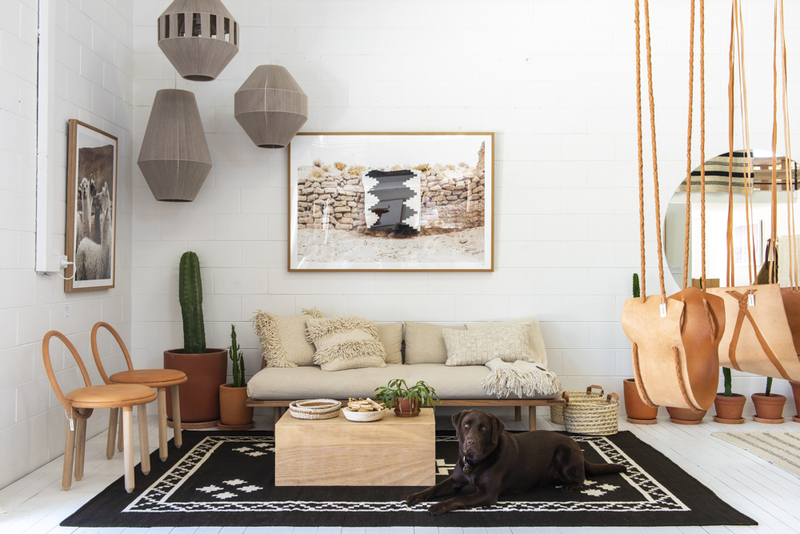 Our studio and showroom is in Byron Bay’s Arts & Industry Estate. It has an open floor plan where the showroom is on the ground level, and our studio is on the mezzanine. Floors and walls are all painted an off white and the shelving, counter and tables are constructed from solid plywood. We wanted to have a simple showroom fit out, to let our products pop and do the talking. It’s full with cactus and terracotta pots inspired in our South American roots. The name Poncho came from our need to stay connected with Latin America, and our love for woven goods such as Ponchos. It is also a word that is pronounced the same in English and Spanish. The name is prefect for our cozy bear! Sometimes in the studio we call him Mr Ponchi-P.
What sort of energy does your dog bring to your studio? He definitely takes the seriousness out of stressful moments. If it’s all getting a little too much we just play with him for 5 minutes and the day instantly brightens up. Now he is a little older he just takes it easy all day, but in the early days he was a real handful and we couldn’t take our eyes off him. 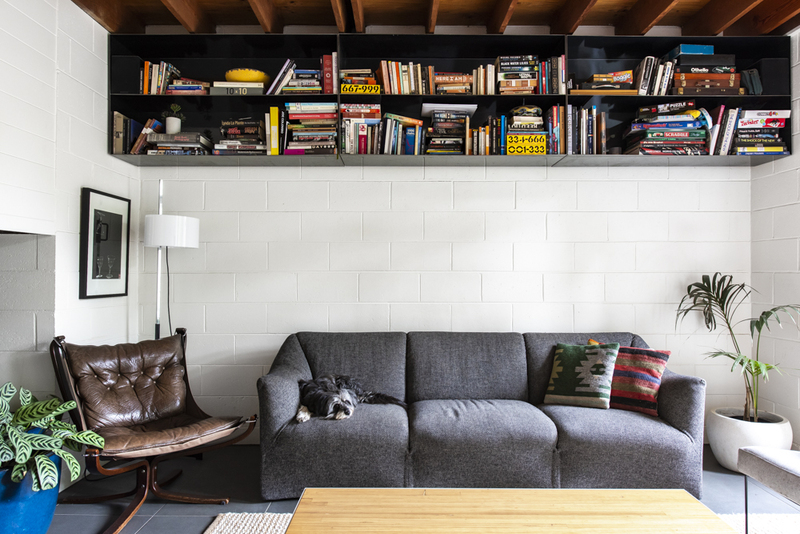 What is your dog’s favourite lounging spot, furniture, or room? Underneath the desk near our feet. We genuinely think he loves coming to work with us - it’s part of his routine. If dogs and their owners are supposed to look the same, does this reflect in the design of your business or studio? I guess it does a little, the colour palette of the woven products in our showroom are mostly natural in tones. The brown wool used in our rugs is almost a perfect match with Poncho’s chocolate brown fur, he almost gets lost in those rugs. How do you think the presence of a dog alters the studio atmosphere? It is a definite ice breaker, people usually are much more relaxed and up for a chat as soon as Poncho shows his face. Byron Bay being a holiday town means we get a lot of people pop in who are missing their dogs at home, so Poncho gets plenty of affection from others and not just us. One day, we left him at home while we went to work (he was around 6 months old) and when we arrived home at the end of the day, he had destroyed a big basket full of toilet paper. The chewed up paper rolls were all over the house. He gave us a look of, I know this is bad, but what are you going to do about it. I remember laughing instead of getting angry because it was obvious that he didn’t like staying at home by himself. Since then we take him to work almost every day, although he has thankfully grown out of this habit now. Ranger is spirited, communicative and friendly. He thinks he’s more human than hound. Still a young dog, he has the energy and swagger of a teenager. He’s quite breathtakingly handsome (well I am biased) and he sits around the place with refined elegance with his silky rust coloured coat, nose high in the air ready to catch any scent that passes by on the hill top breeze. He loves to be involved in all family activities and as we have 4 children he simply has joined the pack as number 5. Even when sleeping he has one ear slightly raised and an eye partially open to ensure he doesn’t miss out on any activity, no matter how small. Our home, The Range Homestead, is an Australian farmhouse with a Spanish influence set amongst the rolling hills of the Byron hinterland. The Range has been built with a conscience for the environment and has many solar passive elements to allow us to tread with a light footprint on the earth. We have many plans to regenerate the land and give back to the earth, much like our other property The Farm at Byron Bay. The Range is a family home that provides us with a sanctuary away from the hustle and bustle of town. It has an earthiness with its recycled timbers and soft textures, and radiates a warmth. It is a place where together we can explore nature fishing in the dam, bush walks through the rainforest and cooking over coals on our stone built fire pit and in the wood fired oven. Ranger is only a year old so still has plenty of joyful puppy moments and boundless energy. He’s very upbeat and positive. He greets us with playful abandonment and strangers initially receive a more robust bark followed by sloppy kisses and frenetic tail wagging. He has a way of communicating that feels almost human. From the sounds he makes to the way he uses his paw to tell us something. He’s an important part of our family that brings out the love in us all. We wanted our home to be a place where the children and Ranger could roam freely from outside and in and for everyone to feel relaxed. We created the house not to be high maintenance and precious. The choices made for finishes were considered with Ranger in mind, like the terracotta floors are a tone of the colour of the earth. On muddy rainy days you can’t really see any paw prints as it all just blends in, these choices all lead to a low maintenance easy way of living. What’s your dog’s favourite hanging out spot/furniture/room etc? Ranger loves the textured Tigmi trading rug to sleep on in the main living room, close to the action of the kitchen but also with good viewing out across the valley. This spot is also close by the side door so he can see who’s coming and going as he’s quite nosey and also suffers from FOMO (fear of missing out) so this is the perfect spot to make sure he doesn’t miss out on anything. He is often seen standing on the rock wall looking out and surveying the valley below, eyeing off the wedge tail eagles as they surf the thermals. Ranger is also partial to the large arched sun bed around the pool courtyard and although not a lap swimmer (he prefers the spring fed damn) he will spend hours watching the kids play in the pool, acting as life guard on duty. Ranger merges beautifully into the aesthetics of the colour palette and design of The Range, particularly with his rust colour coat that sets off the rusty corten steal that is featured in many spaces at The Range. His sleek form is reflected in the house design. Ranger is aptly named as he keeps an eye out always protecting, supervising all outdoor areas, patrolling the grounds and making sure other native animals who live on the property are following the rules. The Range is a doggy heaven, I have a safe den high on a hill that I camouflage easily into, I have acres to roam and I get to hang with my favourite humans every day. Ranger likes to be with us all the time so it’s hard to leave him behind. We have a long driveway and many times we are just about to leave through the front gate when we catch him in rear view mirror panting out of breath from his driveway sprint to keep up with us. Most times we turn around and take him back to the house and bribe him to stay with a treat but occasionally we can’t resist his face and he gets to jump in the car and come with us. Cheeky boy. Ranger’s most recent trick is to try and push an extra chair around the dining table at meal times. I wonder who this is for? Might have to start laying an extra place setting! Luna (male) is placid , gentle and extremely loyal. Valentine (female) is cheeky, feisty and very determined. A tree house suspended with magical dappled light and a real sense of calm. The dogs bring a lot of warmth, love and joy into our home. The dogs love to be outside on the deck in the sunshine or on the bed in my bedroom. The sensibility of our home is quite Japanese and our beautiful dogs are Japanese spitzes. Luna for the moon and Valentine I bought as a Valentine gift for myself. Thank you for the beautiful space we live in. LOVE. Chief is a large black bundle of pure love and joy. He’s treated like a 4th son so he gets to hide behind the bravado of his big brothers but really, he’s just the baby brother that is scared of the dark. When our older boys arrive home late at night they love to creep up on Chief and scare the life out of him. He rushes out to the drive way with the almightiest roar but actually, He’s completely terrified. It’s a boys barn overlooking Byron Bay. Built for mud and motorbikes and hoards of hungry teenagers. We encourage our boys to live a creative life. Weekends are spent on the river fishing, exploring, and towing behind the tinny, evenings are spent in the family art studio and cooking over an open fire. Chief is the heartbeat of our home. He’s calm, consistent and intuitive beyond words. The colour palette for River Hawk Ranch was actually born the day Chief arrived. I have never known a design process to be such an enjoyable journey. Walls are dark to hide muddy markings, floors are concrete to forgive paw prints and everything else dragged in. We don’t like rules and so, there is no place in our home that Chief isn’t allowed. He’s even allowed on the bed for birthdays and special occasions. What’s your dog’s favourite hanging out spot? Chief spends the daytime hours under the creative table where we all work unless we go out and then he relocates to the drive way waiting on someone to return. At night he actually climbs up onto the leather lounge but gently slides off if anyone gets up in the middle of the night for a glass of water. Absolutely! I look nothing like Chief but this house certainly does. It’s rugged and rustic yet warm and inviting. It throws its arms around you and says “welcome”. Chief arrived at the beginning of our family journey up here at River Hawk Ranch and he has bound us together through the hardest and happiest years of our lives. He feels like a gift that continues to glue and guide us. We have a crew of our own boys up here and often half a dozen of their friends… fishing, biking, boarding, camping and building. It seemed fitting that we needed a Chief of the tribe. Could we all sleep in the one room so that I can keep my eye on you all. So, one day when we wanted to go for a paddle on the river without Chief on the front of my paddle board ( he paddles with me at least twice a week sitting happily, watching the birds and fish) we ran him down to river and back up to the barn, fed him his favourite treat and snuck back to the river for a quick 20 minute paddle to the ocean beach. We were just about to dive into the waves when he came tumbling down the dunes to greet us. He must have swam along the river a couple of KM’s beat his way through a nature reserve and followed our scent to find us out on the open beach. He sat very quietly on the board on our journey home. Humphrey is very relaxed with an inquisitive nature and although he enjoys the company of others, he also loves his own space to ponder life. Humphrey is very particular about who he likes to associate with; he has a limited number of favourites and everyone else is tolerable. His movie star looks and nonchalant attitude makes humans and dogs alike desperately wanting to be friends with him. The apartment is one of eight within an interwar period building constructed in the 1920’s and has an elevated view of Sydney Harbour. There was a degree of formality with apartments built during this period and we wanted to capture the essence of that formality with redesigned living spaces which are more relevant to the way we live today. The entire apartment has been completely replanned to establish the living and dining spaces on the harbour side which maximises the incredible views and light.The master bedroom suite which was once the kitchen and dining room features curved art deco walls and has been designed as an entirely separate wing. The principle philosophy was to enhance the existing heritage architectural elements and reinterpret them in a contemporary manner with a layered tonal interior that is warm and rich in materiality. It was important that features such as the original brass door knobs, doors, and cornicing were retained. Open the front door and you’ll hear Humphrey’s feet tippy tapping down the hall to greet you with a welcoming gift of soft toys or underwear stolen from the laundry hamper. Occasionally he will emerge from the bedroom and stagger blindly towards you in a half asleep state. You’ll always be warmly welcomed into our home although energy levels may vary. 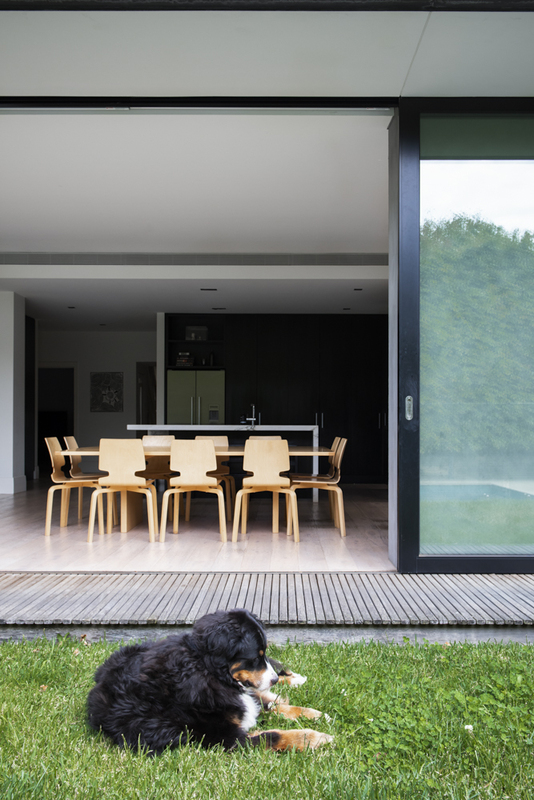 Knowing that Humphrey’s paws would be traversing the floors, wide format timber boards were selected due to its wire brushed texture and depth of colour with heavily patterned grain to contend with claws and any possible scratching. We also lined the fireplace with Santorini marble for Humphrey because he has always loved hanging out in his own cool little dog-cave. The talian marble fireplace is his private sanctuary and gives him full view of the living area whilst also allowing him to keep an eye on anyone going into the kitchen for snacks. He enjoys sleeping in the master bedroom suite - but only on dad’s side of the bed - and will grunt in annoyance if you try to move him. He has also been known to take naps illegally on the Minotti sofas. Humphrey has a collection of vintage YSL scarves which he wears on special occasions. We take much pride in dressing well which is reflected in our home’s highly polished, timeless yet luxurious aesthetic. Humphrey can be very affectionate when he’s in the mood but doesn’t freely dish out love and affection; he likes to make people work for it. He’s obsessed with tennis balls but preferably thrown directly at him so that he doesn’t have to go too far, although in the water he would happily swim to Japan for a tennis ball. He’s also an awesome bodysurfer. We’ve always wanted a golden retriever named Humphrey so he had his moniker before he had even joined our family. People often ask if he was named after Humphrey Bear but it’s actually Humphrey Bogart, one of the ultimate cool, hard-drinking, no-nonsense men of all time, just like our golden boy. We should move this house to the beach. For a while Humphrey was running a scheme where he would find a pair of rubber flip flops, bite off the plug from the bottom of one shoe and then turn it over and place it back with the other shoe. You didn’t know until you tried to put them on. He did this to six pairs which wouldn’t have been such a sick joke if he hadn’t specifically destroyed the right shoe every single time. We’ve had Boo since she was a puppy - she has a beautiful nature, is well behaved, and always wants to do the right thing. She loves everyone to be together, especially on walks. Noodle has only been with us for the last couple of weeks. She is a rescue dog who spent her earlier years primarily confined to a cage. She is very affectionate, understandably a little timid, but looooves her new family. Even though Boo and Noodle are the same age, Boo has assumed the role of big sister. Our home is modern, family focused, and easy to live in. Lots of open spaces with clever zoning and close relations with indoor/outdoor areas. Like all animals, Boo brings a wonderful energy to our home - a constant loving presence, which Noodle enhances - although Noodle likes to snuggle in much closer than Boo. The home came before Boo, but our previous dog Maddie, another Border Collie was defi- nitely considered - she too loved the easy outdoor access and visual proximity to all of the action. Noodle loves to sit as close to you as possible. Boo loves to sit in the ivy, poolside, or in the nook in the ensuite bathroom - she loves to position herself so she has no chance of missing out on a walk or a snack. When Boo is relaxing, she can get herself into some very interesting poses - like a yogi. She also gets quite jealous when anyone in the family is ‘sharing a hug’ insisting that the hug be given up for pats instead. Boo loves how she can be close to the action, and also sneak off to one of her favourite spots when the house is quiet. Noodle loves how much space and freedom there is, and an unlimited amount of love and affection. Any other interesting stories to share? Boo likes to take on the role as “life saver” when the kids are in the pool or ocean - she is always on high alert, looking out for any danger. Keith is an all or nothing kind of guy. Everyone in the neighbourhood knows Keith. He’s got this real strut about him that lives up to his name – a bit tough, but a bit comical. His body bounces when he walks so even though his face looks serious his ears are flopping around. If he sees a ball, he’ll scream, not bark – scream. If he sees food, it’s gone before you realise. He ate a whole Twix bar, wrapper included, from some poor guy sitting on a park bench. When people talk terrace renovations there are the usual things to fix. No storage, little or no natural light and poor connectivity to the outside. What we set out to achieve from the outset was the feeling of infinite space and connection. At 88sqm the house only increased in size by the removal of a side setback. 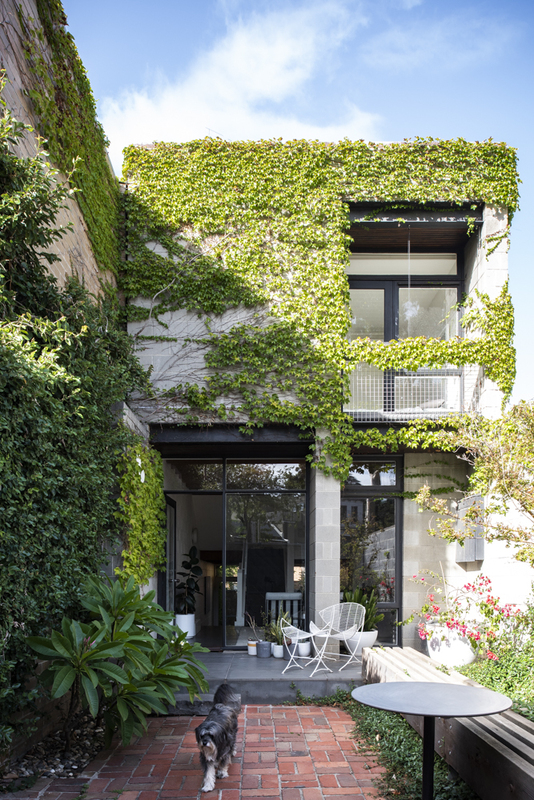 The result is one where the main living space is a continuation of the outdoor courtyard and vice versa. You can be on the sofa and looking out toward the streets trees and genuinely feel as if you are outside under them. He brings his big personality. Like bold colour choices in the bedrooms through to the black timber lined walls, colour has been used to personalise our home. Keith adds to that colour. He’s a constant wherever you are in the house. Always on the go, always there to help and always there to offer an opinion, usually in the form of an affirmative lick. Its hard not to do anything without considering Keith, especially designing a house. There are obvious things like dog doors and garden beds and less obvious things like Keith’s hand-held shower in the bathroom. 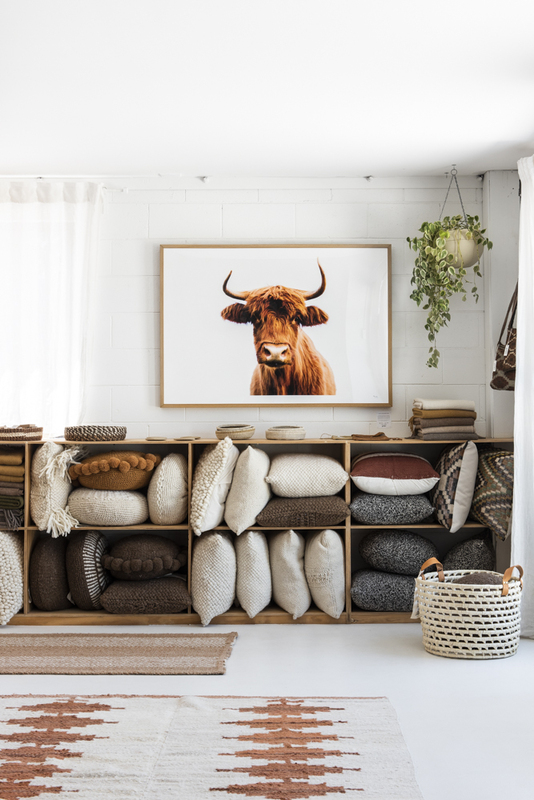 Like his owners, Keith loves sunlight so its movement through the house was a key design consideration with a daybed in the front bedroom allowing Keith to capture those late afternoon rays. I think what we’re most amazed at is Keith’s transformation. He’s a rescue. He came to the pound in a really bad way – malnourished, hairless, flea infested, beaten. No one wanted him. He was clearly very distressed. He’s slowly grown into himself and with each month and year, more of his personality comes through. We’re so proud of him. It’s strange to say it perhaps for a dog, but he’s honestly come so far, and we’re all better for it. He brings us and the people around him infinite joy. Keith’s foster family named him “Keith-e”. We instantly just starting calling him “Keith”. “Keith-e” just seemed too cutesy - he’s a bit of a bruiser. Hilariously, he also responds to “K-Dog” and “K-Bomb”. You always know when you’ve been “K-Bombed”. It often involves Keith wanting to sit on you and give you licks for about an hour. You love it or hate it. Keith actually did “say” something about the house. The first time we came back to the house after the rear was demolished we had Keith with us. We walked down the largely intact front corridor and when we got to the end the rest of the house was literally gone. Keith looked at us. He looked at the empty space. He looked back at us…and then he let out this long, exhausted groan. It’s as though he wanted to know what we’d done to his place! Keith has changed our lives in so many ways – and those of the people around him. We couldn’t take him with us when we moved out to renovate. So he lived Monday to Friday with Ronda, our neighbour and spent the weekends with us. When it got to the end of the build, Ronda make it clear he was still to come to her house every day. And so he does. He trots up to Ronda’s in the morning, and trots back at night when we’re home. Astro is an 11 year old deaf and partially blind Pug, who loves to sleep in each morning until he is the last one in bed. He then requires his walk around the same block that he does every day as he knows all the smells to find himself back home… once he makes it home his paws get wiped as he is allergic to grass. Coco is 13 years old and the oldest in the household (in dog years!) You will rarely see her in the house as she is more like a cat and prefers to make herself scarce. This being said, Coco prefers to keep to herself because she has a long list of dislikes. These include other dogs (especially puppies), loud noises, alarms, speed bumps, vacuum cleaners and thunderstorms. Percy is a 6-month-old black pug puppy. He has just discovered his bark and will take it out on everyone and everything (especially his own reflection). When he is awake, Percy will choose his own adventure and will be exploring every part of the house and return covered in cobwebs or with something in his mouth. When Percy’s eyelids become heavy, he will expect to be picked up and cuddled like a Koala bear for a solid 2 hours. 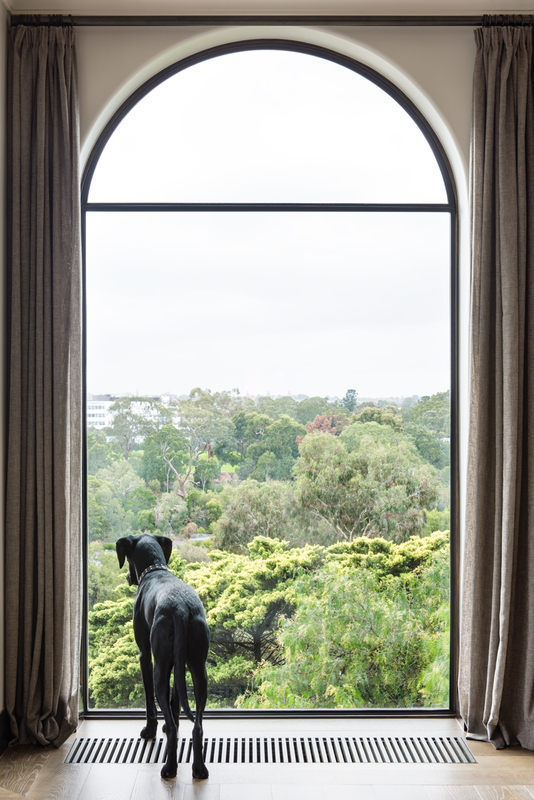 Our 1860 Victorian is a stunning architectural and historical masterpiece, that is set behind the magnificent Gardenia Tree which was planted by Ferdinand von Mueller, the appointed Director of the Royal Botanic Gardens from 1857-1873. Heading towards the back of the house it becomes modern and open, with an L.A kick back by the pool feel. We put in an over the top kitchen, due to the fact that the kitchen is the heart of a home and we have cooks in the house that love wiping something yummy up. Each room has something mad and special in which it has been referred to as stepping into Alice in Wonderland as there is always something different to see behind each door. Mayhem when it is dinner time! But so much happiness and love in the household. No matter how bad your day may be, there is nothing better than seeing the dogs get so excited when you walk in the door. There is an internal courtyard in the middle of the house. It’s great for the dogs when we need to pop out and not have to stress as to what trouble they may be up to. In the master bedroom there is also a large painting of Astro above the bed. Astro prefers to be in the bed and under the sheets snoring. Coco likes to be the first in the bean bag where she is surrounded by her favourite soft toys. Percy loves to be outside in the garden practicing his bark. My daughter named Astro because she loved Astroboy and he was full of energy when he was little. It also means Star in Greek, so I guess he is the star in our eyes. Coco had a beautiful dark chocolate colouring when she was a puppy. However once we named her Coco, she turned into a cream colour! There is still a debate as to who Percy was named after. One argument is that it’s the name of the pug in Pocahontas and the other is the naughty train in Thomas the Tank engine. They love the pantry and require more food in their bowls please and thank you! Berlin has always traded on her looks to get what she wants! The breed is notorious for constantly pushing the boundaries and Miss B is no exception! She is loving, a great companion and my best friend. It’s a bit like a tranquil tree house. The apartment is right in the middle of a canopy of trees on Macleay Street so we look out on to green most of the year. The goal of the design was to make the space relaxed and to be sympathetic to the style of the building. She makes our house a home. When she isn’t here, it feels empty. She likes to work the crowd when we have guests over – especially if there is an opportunity to get a snack from them. She is furious that we opted for a dish draw rather than a conventional dishwasher. Berlin is quite the pre-rinse cycle. Her favourite thing used to be getting into the dishwasher for a good lick. Unfortunately she can no longer do this. Berlin has two beds – one in the office which gives her a line of sight to the kitchen , and her second bed is in the master bedroom. She used to sleep in her own room, but would bang on the door in the middle of the night to come into our room. Eventually we gave up, so she sleeps where she wants now! Definitely in the colour scheme. Berlin is a muted colour, and the apartment is definitely co-ordinated to her colouring. Her uncanny ability to know when I’m getting chocolate from the fridge. Somehow she knows the sound and doesn’t even look up from her bed as she knows that chocolate is a no no. It’s a nod to her German heritage, although she does go by a few names: Miss Lin, Miss Berlin and Miss B.
I wish it had a lift! Ivy is a perennial puppy. She loves company, being centre of attention and cheese. She is very soft and gets more than her fair share of pats as a result. Home is a renovated California Bungalow in the Arts and Crafts style with a modern rear addition. Ivy is full of energy if a walk or a ball is involved. Otherwise she will move quietly to wherever people are and sleep. She is a calming influence. Ivy likes to sleep in the library, a central point where she can be in contact with whoever is home. When the older adults are away she likes to “visit” the younger family members in the upstairs bedrooms and lie on the beds. Ivy is soft both physically and in nature. She draws people to her. Ivy came to us prior to our renovating. At the time the front garden and fence was dominated by ivy. We love botanical names and it stuck. Noodle is our fifth daughter. When the girls run for a hug at the end of the day, she’s right in there pawing and clawing for her bit of lovin. Every night she will choose a different bed to sleep on - she doesn’t play favourites. She’s just gorgeous placid easy wooly chick who is a big part of our tribe. Her vibe is relaxed and easy, and she often places herself right in the centre of the action. She’ll place herself on the stairwell like sentinel so she can keep an eye on the flurry of comings and goings in a house of 6. When we light a fire, she’ll sprawl herself out on the hearth, legs akimbo, head back, like a royal corgy. It’s hilarious. In her high energy race dog moments, she'll flog soft toys from the girls bedrooms and tear through the house with them locked in her jaws. This often ends in a mad Bugs Bunny chase under tables and through the kitchen with screams and barks - all good fun. She always gives it back to the girls in the end. They’re honestly like a pack. She goes from room to room in the morning and licks their faces to wake them up for school. Sooky to the extreme! Only happy if he is with me. Curious , loves to visit people and places, and as a result he comes everywhere with us! We take him shopping, parties, restaurants, outdoor cinemas , holidays, and chopper flying! He is very easy and is happy to be a part of all facets of our lives. No, other than an expensive dog bed that he doesn't like! His favourite room is our bedroom, where he sleeps beside me at night. A lovely one! He is thrilled when someone comes home. As a very vocal dog, whatever he is feeling he vocalises, so it's lovely to hear him sighing with happiness , just to himself, when we are all home with him. He is a rescue dog who had been abused, so he seems to appreciate his change in circumstances! The first few years we had him, if I left him he would find and destroy a shoe, only mine. Since we moved to this apartment, one occasion he was dogsat, he wee'd in the spare room. After that he would return to that same spot if ever the door was open.